Every since Sonic PI had a transparency mode added (not available on the Raspberry Pi versions) I have been interested in adding a Visualiser graphics display as a backdrop. The built in Scope can give attractive displays, but I wanted something with a bit more colour, and which covered the whole screen. I did some experiments with the iTunes visualiser which added quite a nice backdrop, but only with a significant delay between the audio and the fluctuations of the display. The recent arrival of Sonic Pi 3 allowed for further possibilities, because it enabled the use of OSC messaging. I did a trawl of the internet and came across a promising looking processing sketch which produced a pattern which reacted to incoming audio. It was written several years ago and was only monochrome based. I played around with this, upgrading it to work on the latest version of Processing, and added some colour. I experimented with adding further basic shapes to the display (it originally used an ellipse primitive, set up to give concentric circles, which could also be driven to produce a star burst effect). I added rectangles and star shapes and experimented with off-setting these as the program ran, and also with using more than one basic shape at the same time. I then added some code so that the sketch could receive incoming OSC messages sent from Sonic Pi 3, which could be used to control various parameters for the shapes, such as stroke width, colour, and offsets on the screen. I added further flexibility such as the ability to rotate the shapes, and to shift the whole display vertically and horizontally across the screen. The final setup works well with Sonic Pi 3, which controls the patterns both with the Audio signal it produces, and also with OSC messages which can be sent to the sketch display code. These can be timed appropriately with the musical content. //added OSC input (from Sonic Pi) to alter parameters as it runs, removed slider inputs. // What is the average height in relation to the screen height? The basis of a visualiser depends on doing a fast fourier transform analysis of the incoming audio, and calculating amplitudes related to the different frequency components of the audio, which is continuously monitored input buffer by input buffer. I don’t intend togo anywhere near the complex mathematics involved, but there are a lot of useful articles at different levels which you can read on the subject. I quite liked this one on the Fourier Transform. https://betterexplained.com/articles/an-interactive-guide-to-the-fourier-transform/. Also it is useful to look at the documentation of the minim library analysis section http://code.compartmental.net/minim/index_analysis.html if you want more detailed information on the calls employed. You may find it easier to look at the original sketch from which I started https://github.com/andrele/Starburst-Music-Viz before taking on board the additions I have added to make the sketch more flexible and wide ranging. I have added various transformations. Starting at the beginning of the main draw() function there are x and y offsets which increase each time the loop iterates, until a maximum offset is reached, when they reverse in direction. This causes the shapes to move smoothly left and right and up and down the screen. a shiftflag eanbles this to be siwtched on and off by one of the control OSC messages. There follows an optional rotate command which can rotate the axis of the shapes being drawn, again controlled by an incoming OSC message. Next values for setting the limits on the stroke size being used to render the shapes are read from data received by an OSC message, together with an audioThreshold setting. A buffer from the input audio is now processed, and amplitude values for different frequency ranges are stored in an array of “circle” settings. NB the name circles is used for the variable as this was the only shape used in the original.Perhaps it might be better names shapes() now as there are three different classes of shapes used. A new value for the “radius” is stored if it is less than the audioThreshold setting, otherwise, a “decayed” value of the currently stored value from the previous iteration is stored. (suitable minimum values are set). rgb colour values are set using values received from an OSC message, and these are then swapped at random, before setting the stroke colour attributes to be used. Next a flag two is set according to whether one or more than one shapes have been selected. In the latter case the shapes are forced to be drawn concentrically, by nullifying the offset values by setting two = 0. The selected shapes are then drawn, before the loop starts a further iteration. The oscEvent(OscMessage msg) function is triggered when an OSC message is received. It contains sections to parse the various OSC messages which can be sent from Sonic PI to the processing sketch. The parameters for each command are used to update various lists containing information used by the draw function.eg cols[ ] holds rgb values, startdata[ ] holds the parameters for the star shapes, fvalues[ ] holds the floating point values for the STROKE_MAX, STROKE_MIN and audioThresh settings. These and other similar settings are updated when the relevant OSC messages are received, so Sonic PI can control the operation of the sketch as it runs. The star functions draws the star shape. It is lifted straight from the star example here https://processing.org/examples/star.html. The final function kill( ) is used to send a /stop-all-jobs OSC message back to Sonic PI to stop all programs running on that machine. It can be triggered by a /viz/stop OSC message being sent from Sonic PI to the Sketch. Secondly, Sonic PI is used to send OSC messages to the processing sketch to control its various parameters. this can be done by sending “one off” messages or by putting the message sender into a live loop, sending messages at regular intervals. An example is shown below, where the OSC messages are combined with the program producing the music, but they can be run as a separate program in a different buffer, which is an advantage if you are visualising a linear piece and do not want to restart it every time you press run to update the OSC messages sent. 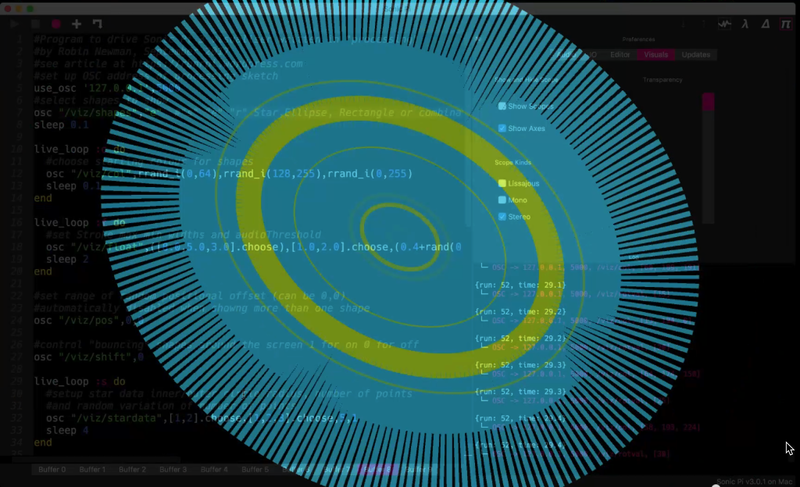 #Program to drive Sonic Pi 3 visualiser written in "processing"
You will also have to install the libraries Minim and oscP5 from the Sketch=>Import Library… menu. 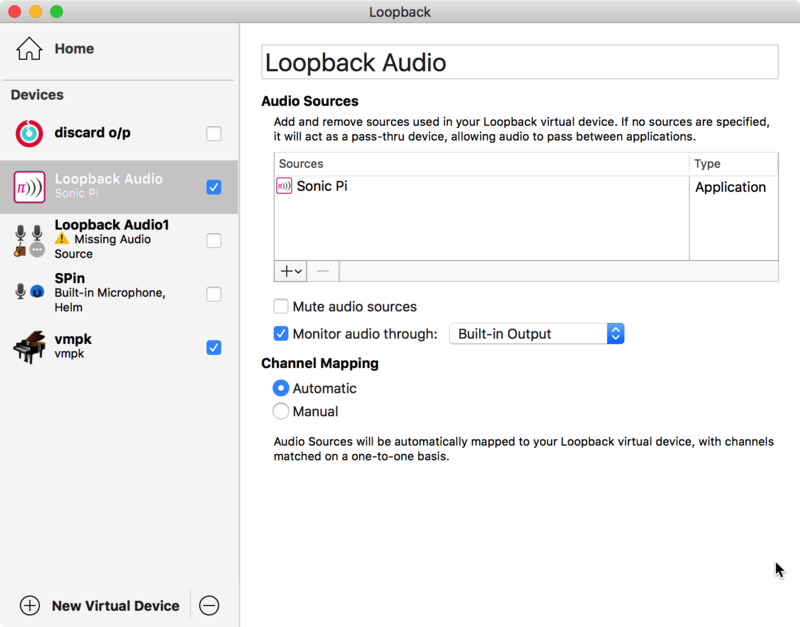 To use, set up the loopback audio and select it as the default input device. Load and play the sketch in processing, then run the Sonic Pi program on the same computer. You can adjust the transparency of the Sonic Pi screen on the Preferences Visuals tab to make it semi transparent, or minimise Sonic Pi once it is running, if you are not going to do live coding of the control OSC messages. Following on from my previous project with a single McRoboFace, 4Tronix have kindly supplied me with a second face to enable me to develop the idea to control two McRoboFaces with Sonic Pi. I have amended the previous project to feed the outputs of the left and right audio channels to two separate adc inputs on the piconzero board, and daisy chained the two McFaces (you merely connect the Dout pin of the first to the Din pin of the second) and then address the leds on the second McRoboFace with an offset of 17. I have developed routines in the python driver program to control each face separately. Each mouth can be set to a fixed position: closed, open, smile or sad, or can be fed from the audio input via the adc, so that it is triggered to open when the signal exceeds a preset threshold. In order to provide greater control, and to synchronise it to the audio feed from Sonic Pi, I have added Ruby routines to the Sonic Pi program which can send text strings to the python program via a text file. These strings can set the mouth state for each face, and also alter the colours of the leds. 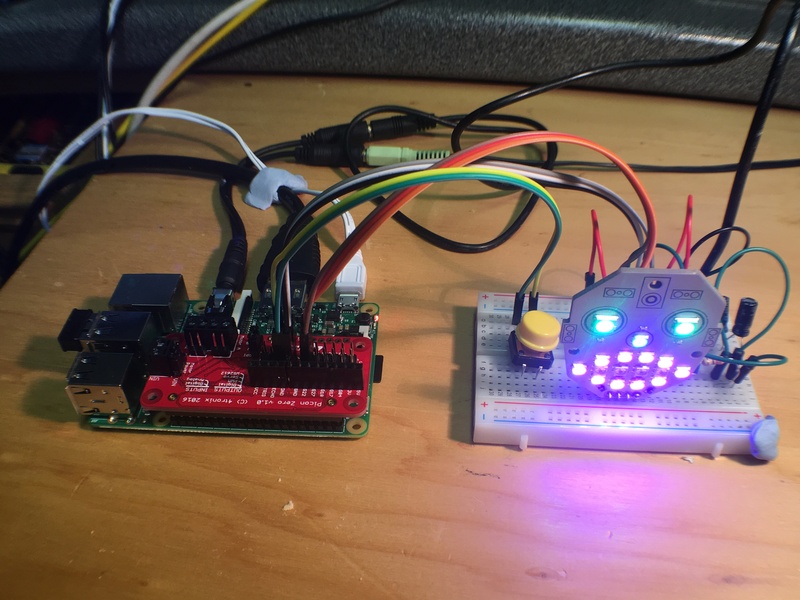 because there is only a common brightness setting for both faces (using pwm) If only one face is receiving audio I use that output to control the brightness of both faces. If both faces are set to receive audio then I set the brightness at a fixed value. The conversation is entirely controlled from Sonic Pi. It plays the audio for each face via a series of pre-recorded samples, and plays each face with a separate audio channel by setting the pan: value either to -1 or to 1. Before each sample is played, control signals are sent via the text file to set up the required state for each face. At the end of the presentation both faces receive audio input together as they “sing” along to a round of Frere Jaques. Finally a control signal is sent to reduce the brightness to zero, effectively switching off all the leds. Writing and reading the data via a text file is perhaps not the most elegant way to do things, but does seem to work OK. I used a technique I developed previously when reading in large numbers of sample files to “hold up” the Sonic Pi program utilising a cue and sync while the writing completes. Otherwise you can run into “too far behind errors”. On the reception side, at the start of the main program loop the python program polls for the existence of the text file, and if it finds one, reads the data, then deletes the file. It then alters parameters according to the received data. It took quite a lot of experimentation to get the timings and consistent operation of the two programs correct, but having done so, the final system is quite stable. I boost the audio levels to amp: 4 in Sonic Pi, which gives a good signal for the adc inputs to latch on to. Setup is fairly straight forward. The calibrate button used in the single face project us utilised again, and sets separate offsets for each channel, and the code used to modulate the mouths is very similar to that used in the previous project. Once set, the Sonic Pi program can be run several times, leaving the python program running continuously.. I have enjoyed this project, which had brought together Sonic Pi, Ruby and Python in an interesting way, not to mention recording and processing the samples with Audacity., and I hope you enjoy the video of the final system. I hope it may be possible to write up teh system more fully in the future, but it will be quite a big job to do so. 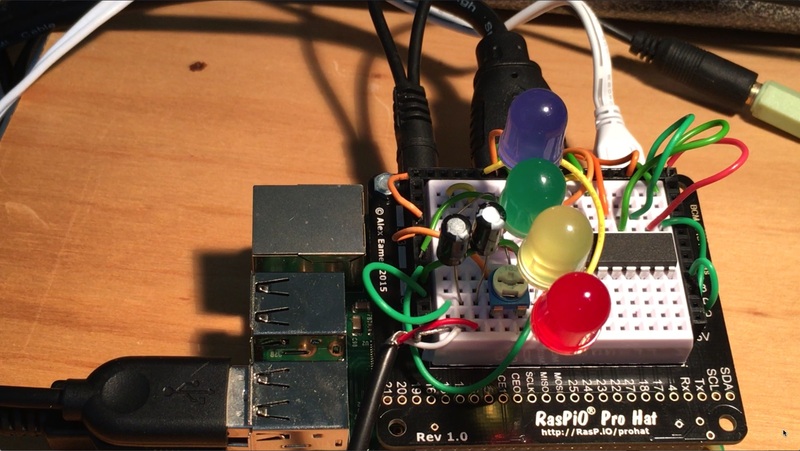 Ive recently added an article describing how to use the RasPiO ProHat to build a 4 led bar graph which can be driven by Sonic Pi. It also uses components from RasPiO’s Experimenter’s Kit. The article contains full constructional details with links to the python program, and videos showing the construction and use of the project. 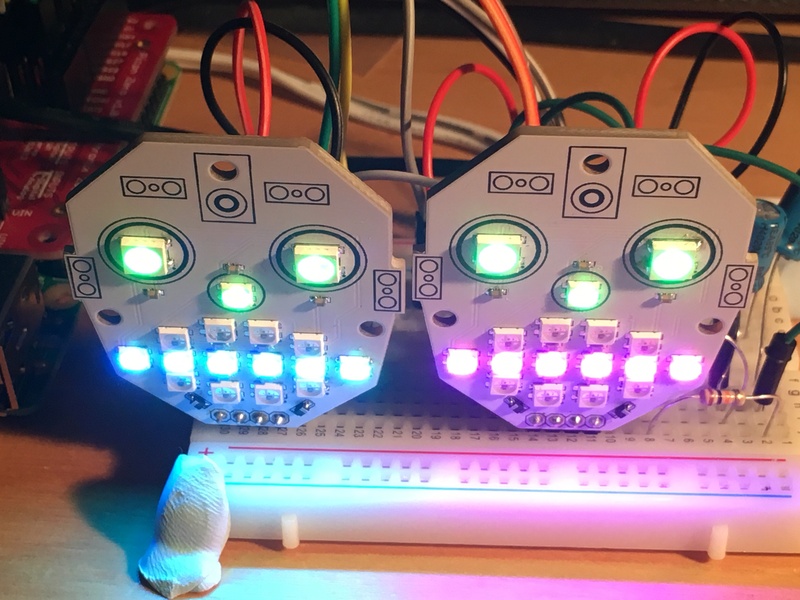 Recently I was sent a pre-production version of 4Tronix McRoboFace, which is a small face whose features light up with 17 Neopixel leds. It is ideally suited as a companion to their Picon Zero controller board, which already has software in its library to accommodate it. I experimented with the item, and the result was a project to produce a talking/singing face, which could respond to an audio input either fed from a microphone, or internally from a raspberry pi running Sonic Pi. An article here gives full constructional details and links to the software used. 4Tronix hope to launch a kickstarter project for the McRoboFace soon. If you support it, this will give you a nice project with which to use it. video link to the project in action, explaining itself! The third and final part of my MeArm robot arm controlled by a wireless PS3 Controller is now available here. It adds some further commands to the robot repertoire, and also features a new video showing the arm being put through its paces. In this second visit to the MeArm robot I add the ability to record and replay a sequence of movements by the arm.